Unlike Flash, the HTML5 platform is a very simple script based platform that uses a feature called canvas which allows users to render graphics on the fly without using any third-party proprietary plugins. It’s a mobile world and everyone expects their content to be viewed/displayed in the original format without any dependency related issues. Our technology can help you in making your ideas… Go mobile!! DigitalOfficePro’s PPT to HTML5 conversion technology works so perfectly that it gets into the intricate details of PowerPoint , reads each entity one by one (text, shape, animation, transition, timing etc.) and then converts it to the latest HTML5 format – a platform that works on almost all modern devices including iPads, mobile devices, desktops and modern browsers. Why HTML5 based PowerPoint Slideshow ? Many leading top-notch mobile devices like ipad, iphone and other Android devices do not support PowerPoint / Flash Slideshow. With the advent of HTML5, it became clear that this technology with soon replace Flash in terms of its cross platform support as well a mark in technological advance. Main advantage with HTML5 output is that you do not need to install a plugin to display your content which is not the case with Flash. Time has changed with more and more people hooked into their ipad /similar devices rather than to their PC’s. This stimulated the need of a PowerPoint to HTML5 conversion tool which would retain the aesthetics of the original PowerPoint presentation as accurately as flash did. Take advantage of PowerPoint to HTML5 technology and easily integrate it into your software using our SDK (Software Developing Kit). 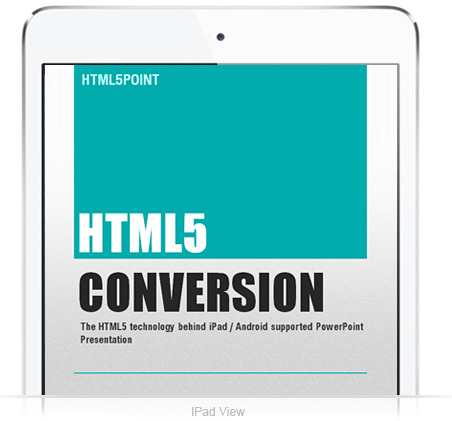 Developers can leverage our advanced PowerPoint to HTML5 conversion tool in an easy, fast and economical way for Desktop applications, Web applications or Web services. All most all the animations in PowerPoint are accurately preserved using HTML5 technology. Virtually all transitions from the original presentation are perfectly retained on conversion. Fonts and effects used in the PowerPoint presentation keep their original appearance in the HTML5 format. Embedded media files like video and audio allows user to create visually stunning presentations that work on wide range of devices.